Would you like to be known as "the universal engineer" and have a hand in many different engineering disciplines? If so, chemical engineering is the degree for you. With your love of math and chemistry, you will strengthen your skills in preparation for one of today’s most versatile engineering fields. From environmental to energy to medical, countless fields rely on chemical engineers. With a bachelor's degree in chemical engineering, you will be able to design safe, sustainable, and economical equipment for large-scale chemical or biological manufacturing plants. You won’t be stuck in the lab, though. Chemical engineers frequently work to protect the environment by inventing cleaner technologies or modeling the environmental impacts of chemical processes. Our state-of-the-art facilities allow students to experiment with real-world applications of classroom theory. The Unit Operations Lab affords students a unique opportunity for hands-on experience in chemical processing. Get ready to contribute on the job from day one. Our students benefit from hands-on experiences ranging from Enterprise to capstone to internships/co-ops. 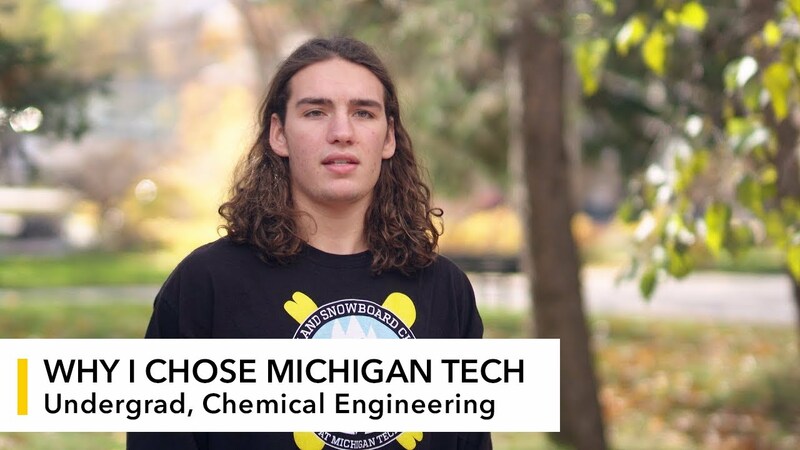 The Michigan Tech student chapter of the American Institute of Chemical Engineers is very active at both the undergraduate and graduate levels. Check out the chapter’s activities, which bring together students, faculty, staff, and industry leaders. Chemical engineering faculty and staff focus on giving students the personal attention and support necessary for not only academic success, but also a positive undergraduate experience overall. Faculty encourage students to take advantage of their open-door policy. Michigan Tech offers a technical communication course designed especially for the undergraduate chemical engineering curriculum—specifically in response to industry’s demand for better communicators. Opportunities for intercultural exchange abound at Michigan Tech. The Study Abroad Program sends students to countries around the world for stints ranging from two weeks to one year. D80 allows students to apply their engineering skills to the problems facing economically disadvantaged communities. Students who graduate with a BS in Chemical Engineering are prepared to transition directly to entry-level jobs in industry; however, an advanced degree is desirable for research positions. Students interested in a career in academia should explore graduate education options. Chemical engineers enjoy an average starting salary that is consistently among the highest in the nation. Where have our chemical engineering graduates found employment?